So the big news in my life is that I got a new job! 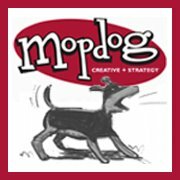 I'm very excited about the opportunity to work with Mopdog, a design and branding company. Starting Tuesday, I will be a Marketing Communications Coordinator, working with different accounts on marketing/pr strategies, social media, writing/editing and a touch of design. Mopdog is a small company with fourteen people in Kennesaw. They work with all different kinds of companies handling their advertising. I've talked with some of you about going back to school for graphic design. My plan was all depending on if I got a job in my field by January. If I didn't get one, I was considering going to SCAD for a certificate. However, since I did get one, I will most likely get a certificate by taking night classes from Kennesaw State, or a school of the like. Hopefully I will learn about it being around the great designers at Mopdog. I've been wanting to get back into my field, so I'm really happy that God has provided me this chance. As much as I will miss the people at Motion Reality, I have to remember that change is good. Congratulations Rachael! Thats awesome news. And other news: PLL last week?? I am beside myself about Toby. And still feeling confused.